Little things matter in life and at times it’s the little things that affect us the most psychologically. Imagine the mental agony you have to go through when you reach your office and suddenly realize that you didn’t lock the door of your house. A small reminder when closing the door can help you in this particular scenario. While we have reminders in our mobile phones and other devices, they only work and remind you of something at the time you have specified at the time of setting the reminder. These smartphone reminders cannot sense and remind you of something right on the spot. That’s when Kaka comes in. This little device that looks like a ball is a reminder with amazing features. 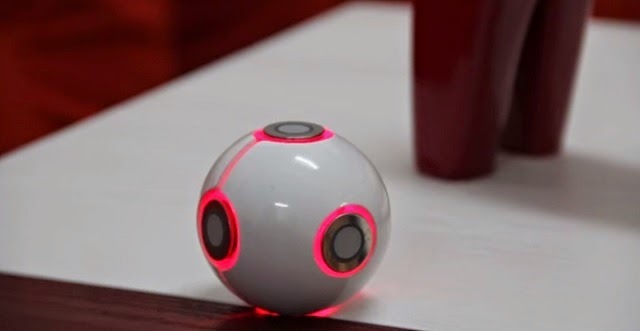 This ball shaped device has sensors on it that help it remind you of something important just at the right time. It can be set to remind you of something important by sensing touch, voice, light and motion. There are magnets located on it that allow you to stick it to a metal surface when there is no proper place to put it down. It looks beautiful with its blue and red LEDs that glow and blink to signify a particular function in use. The blue lights are on when Kaka is playing back a recording whereas the red light is turned on when you are recording something. The maximum recording time on the device is of 1 minute for now. As soon as Kaka senses sound, vibration, motion or light, it plays back the recording with crystal clear sound. This is what’s amazing about Kaka. The sound played back to you is of high definition quality so you can hear every word clearly. The device is chargeable and with moderate use it is said to last for nearly 5 days after onetime charging. The charging is simple and easy with a micro USB plug. The device is even smaller than a tennis ball, making it easily portable. Put it on the dashboard of your car, on your office desk or on a table near the door to remind you about locking the door every time you close it. You could place it near wet floor so every time Kaka senses someone coming close to the floor it will remind that person about it. It can also serve as a receptionist at the entrance of an event or in your office. Just program it to greet the people by recording your greeting and choosing the sensor and Kaka will do the rest. Put it on the side table right beside your bed where sunlight falls in the morning. As soon as it Kaka detects light it will start to remind you of waking up. With the wakeup call you can also record other important tasks that you need to perform during the day. Or you can simply record a task that you have to perform on a particular day and that you don’t wish to forget. The device can use only one type of sensor at a given time.